Day 25 was an exciting day for me! For my birthday this year, I was to spend it in San Francisco – one of my favorite cities in the US. 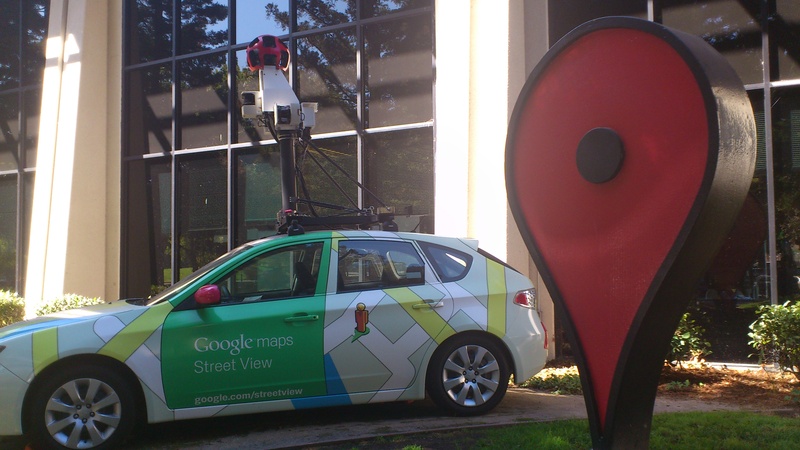 However, before we went into the city, we made a stop for a special tour of Silicon Valley. My friend works at Google, so we were lucky enough to get a personalized tour of the campus! 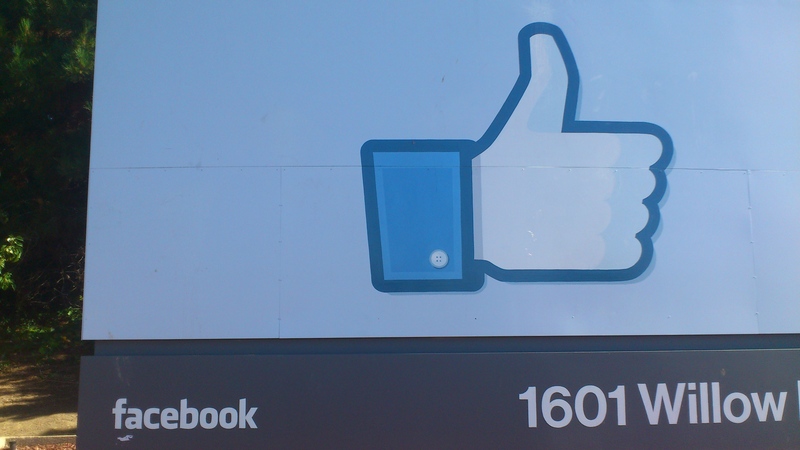 Before we arrived, we made a quick stop at Facebook to take a picture at their Like sign at the entrance of the company. 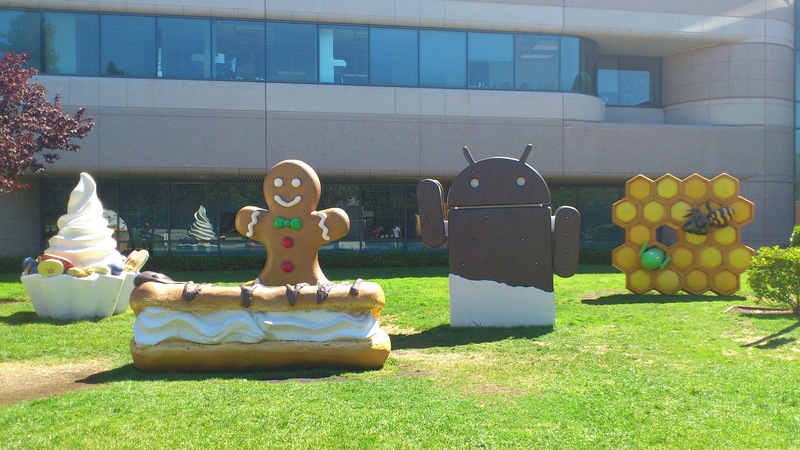 Arriving at Google – I couldn’t stop taking photos of all the neat sights! We were taken around to different photo ops! We also visited the official Google Store, which was open only to employees to purchase (for guests who want to buy something, you must have an employee show his/her badge to buy something). I picked up a soft android stuffy and some YouTube magnets for souvenirs! We then encountered a special BBQ day outdoors and grabbed a bite to eat. There were several cafeterias and we kept learning more about the perks Google offers its employees – which is why they are one of the top employers! After our bellies were full, we made our purchases and visit of Google, we said our goodbye and departed to drive the 45 minutes into San Francisco, where we rented an apartment from airbnb, which was more feasible than downtown hotels (cheaper, includes a kitchen, laundry facilities, and safe free street parking!). We stayed in Outer Sunset, a neighborhood with lots of Chinese restaurants and stores on Noriega Street. It reminds me of Vancouver’s Joyce Street or Victoria Drive area. 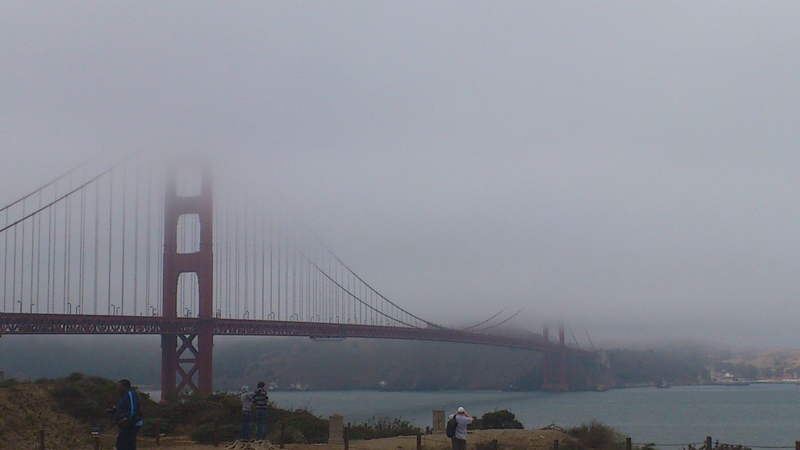 We arrived on a cold, cloudy day – so our pictures of Golden Gate Bridge were not as great as we had hoped. After dropping off our luggage at the apartment, we ventured out to Chinatown – the largest in North America! 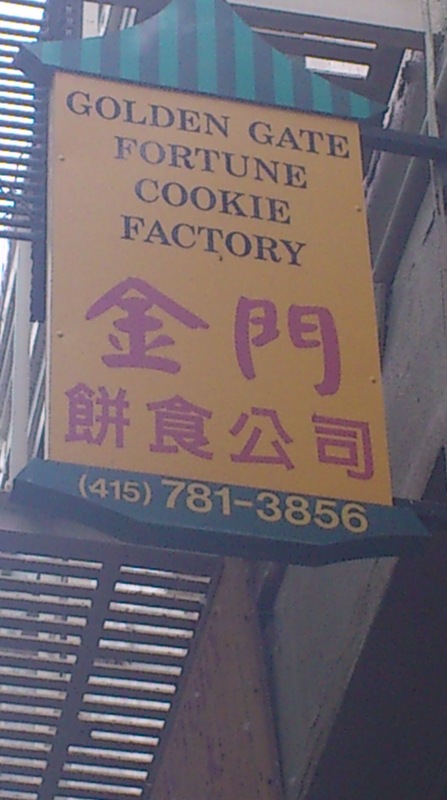 I love visiting San Francisco’s Chinatown – as it has a mix of new and old Chinatown – the old being the heritage buildings, the Chinese associations, seniors busking on the street playing their classical Chinese musical instruments, and the Golden Gate Fortune Cookie company (made by hand)! The new part of Chinatown includes all the souvenir shops – some with new western-fused souvenirs. We managed to pick up some $2.99-$4.99 bobbleheads – including an Archie & Jughead bobbleheads! My favorite Haribo candies were also available cheaper in Chinatown! 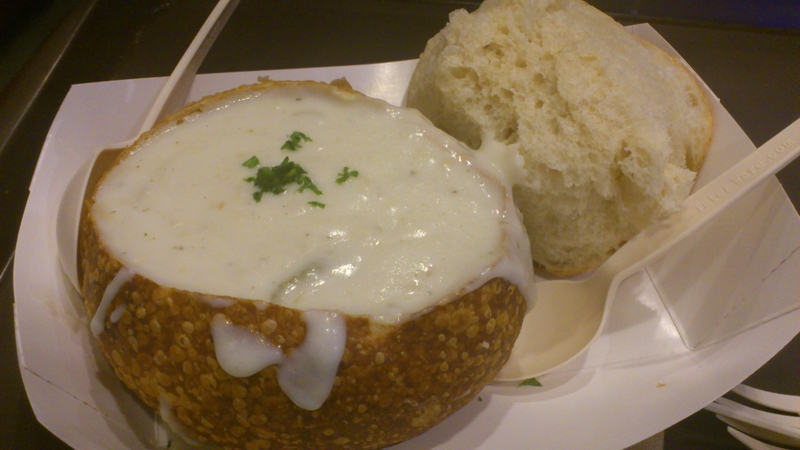 As we were getting hungry, we headed to Boudin Bakery at Fisherman’s Wharf for a bowl of their famous clam chowder in sourdough bread. We didn’t want to eat too full, as my bf was taking me to a surprise dinner for my birthday. We walked around Jefferson Street along the Wharf, but as it got too cold, we decided to save Pier 39 for the next day. 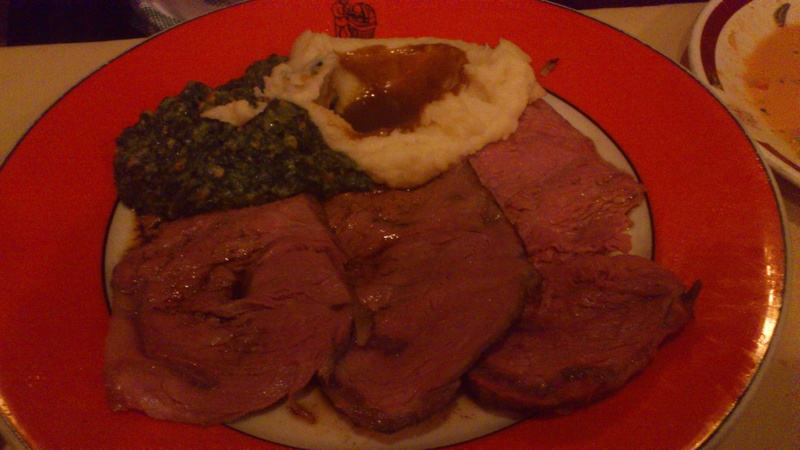 For my birthday dinner, I was surprised my bf took me to the House of Prime Rib near Nob Hill. This restaurant was busy on a Thursday night – we were told there would be a 25-30 minute wait – luckily the wait was more around 20 minutes. While waiting we could sit at the bar and order a drink and snack on some nuts. Great bar service staff and ultra friendly servers! The House of Prime Rib menu consisted mainly of Prime Rib – you had 4 choices of sizes of prime rib – each comes with a special house salad, baked or mashed potato, yorkshire pudding and either creamed spinach or creamed corn. There was also sourdough bread on the table prior to our meal. We ordered The English Cut (3 thinner slices of Prime Rib) and shared the dinner, as it was quite a bit of food – they charge an extra $7 to share so that you can get an extra salad serving for the two people. As it was my champagne birthday, I ordered a bottle of champagne ($11) for a toast. The prime rib was delicious! 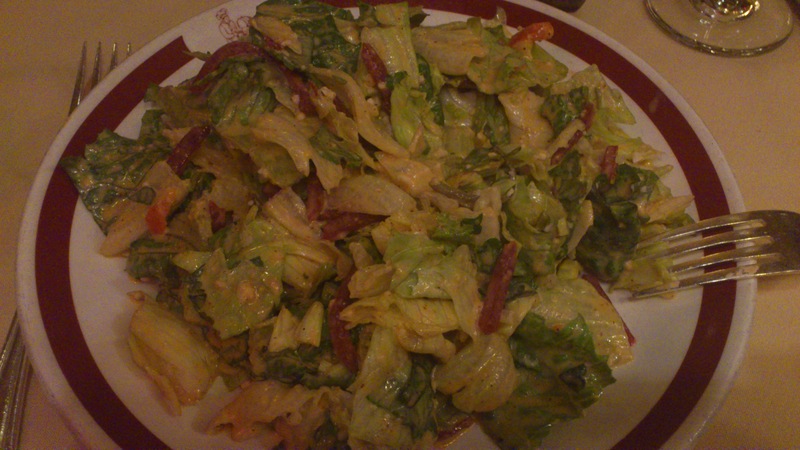 The salad could have been better if it was not drenched in salad dressing. Next time I come back, I’ll be asking for less dressing on the salad – otherwise very good size and quality! The mashed potatoes and yorkshire pudding were really well done and I wish there was more – should have ordered my own! There was enough for us (especially since we had the clam chowder prior), so we did not order dessert. I think my next visit to San Francisco I’ll try to head to this place again for their Prime Rib! After dinner, we went for a walk at the top of Twin Peaks to check out the night view of the San Francisco city lights – however it was really cold that evening and cloudy – so we called it a night after an eventful birthday. The next morning we set off early to Fisherman’s Wharf – where we enjoyed brunch at Sabella & La Torre. 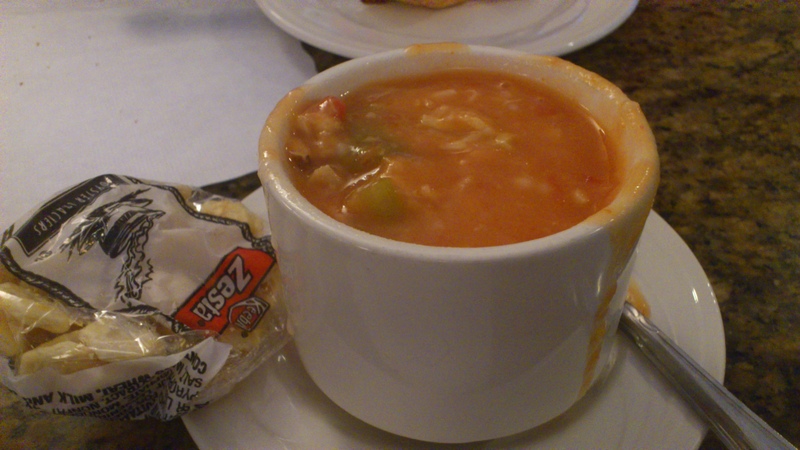 We had a seafood brunch filled with clam chowder and fresh seafood! After a full stomach, we took a walk on Pier 39, where we took in all the various shops and window shopped. We saw the sea lions sunbathing on the pier, and went to purchase some Ghirardelli’s chocolates before we lined up to take the historic cable cars. 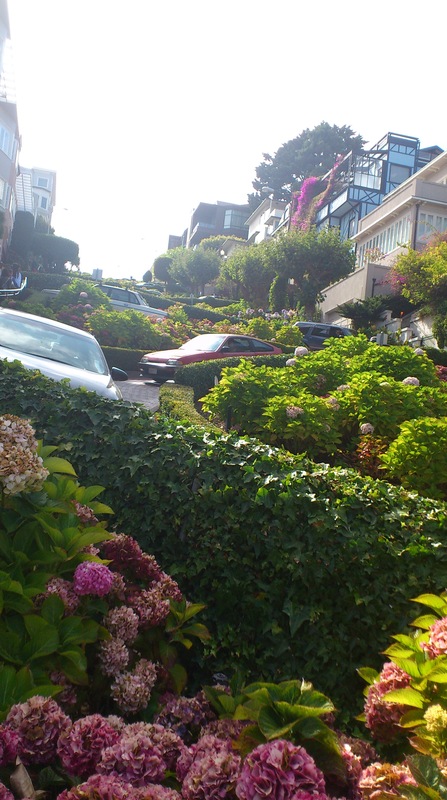 Half walking up a giant hill on Hyde Street, we eventually caught a cable car to Lombard Street – where it hosts the world’s most crooked street. We then had trouble catching the cable car downtown, so we walked down 4 large blocks to catch the Mason-Powell cable car instead and got to hang on the cable car to truly experience the cable car! Downtown, we took some photos at Union Square, and then shopped all the various shops. To those UNIQLO fans – they are opening up a store downtown in Fall 2012! 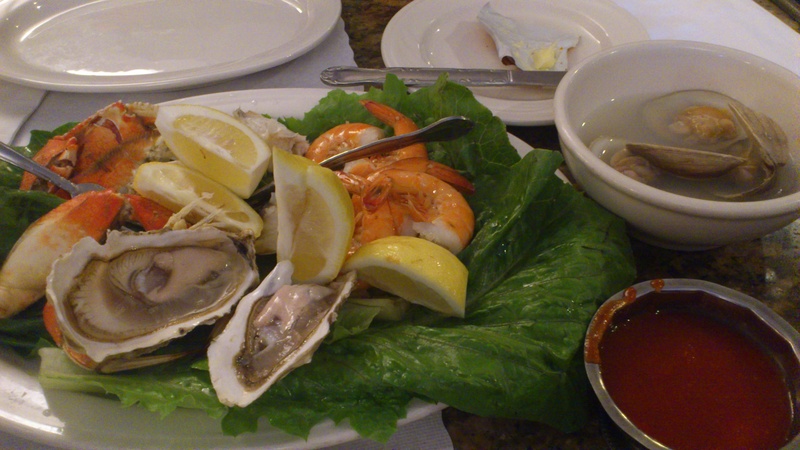 Hungry and tired – we ventured back to Outer Sunset, where we consulted Yelp! for a Chinese restaurant recommendation, as I had a craving for Chinese food. We enjoyed delicious shrimp-filled wonton noodles at Ming Tai Wun-Tun Noodle. The price was good and the food quality was comparable to some of the places in Vancouver. For $7.99 you can get a bowl of shrimp wonton noodles with a small side plate of gai lan, and a milk tea! 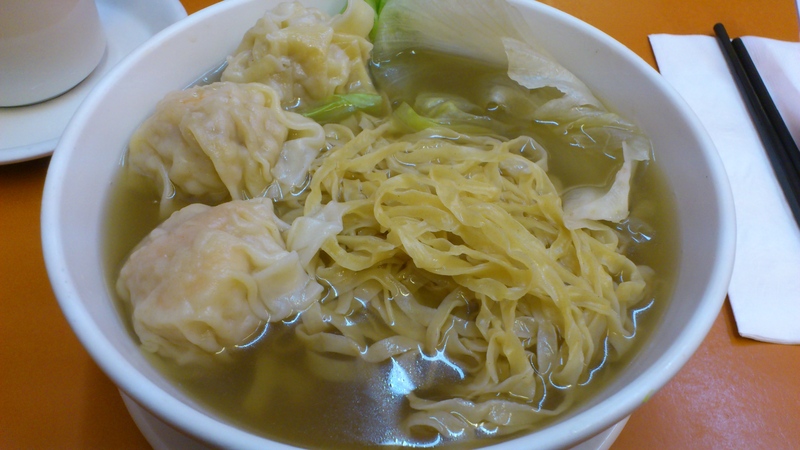 The wontons had ample shrimp in it – really great quality – something similar to what I would find in Vancouver! 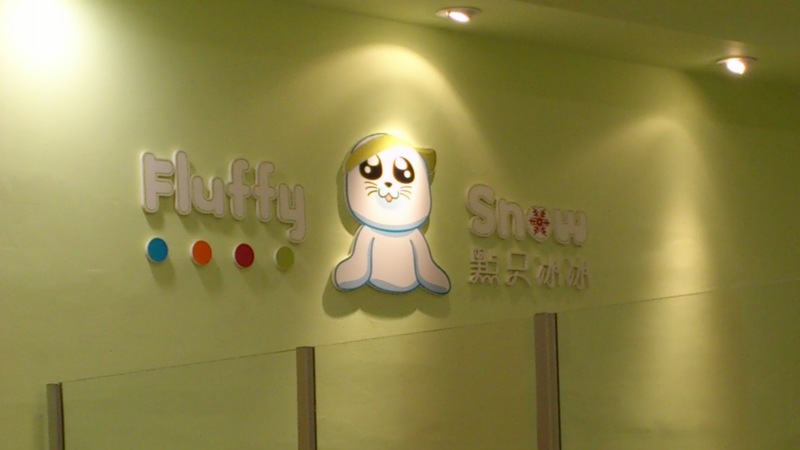 After dinner, we went to Fluffy Snow, a Taiwanese bubble tea and shaved ice/dessert restaurant. 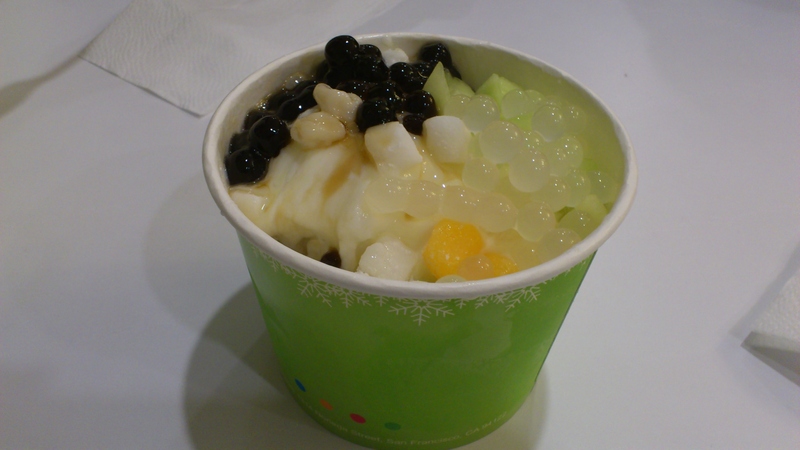 We shared a large lychee shaved ice, with lychee poppers, mochi, tapioca and honeydew with condensed milk. I found it only to be ok – great for San Francisco standards, although in comparison to Vancouver such as Frappe Bliss, I still prefer Frappe Bliss. We took a drive around the Castro district, and then again to Twin Peaks to enjoy the night lights on our 2nd night in the city – a clear evening that allowed us to even see the Golden Gate & Bay Bridge from up top. It was a beautiful night to end our San Francisco stay. San Francisco, I will return and visit soon! Hi Phyllis – my blog is actually hosted directly by WordPress. Hope that helps!